Snacking on a handful of almonds, walnuts, or pistachios each day might keep you healthier and help you live longer. A study published Nov. 21, 2013, in The New England Journal of Medicine found that nut eaters had a 20% lower risk of dying over a 30-year period, and were less likely to succumb to conditions like cancer and heart disease, than those who didn't eat nuts. To reach this conclusion, researchers looked at more than 76,000 women and nearly 43,000 men, who were asked about their nut consumption at the start of the study and then every two to four years during 30 years of follow-up. 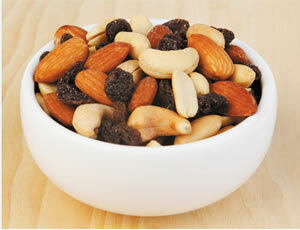 Nuts help lower LDL (bad) cholesterol and raise HDL (good) cholesterol, while they lower blood pressure. A variety of nuts offer health benefits, so pick your favorite to snack on.